Like a well-pulled shot of espresso, a perfect French Press brew is a bold, flavorful drink that is simple to make but difficult to master. And, like espresso, there are some coffee drinkers who love it, and others who prefer to pass on this traditional brewing method. Unlike a high-quality espresso machine, however, a great French Press can be fit in just about any coffee lover’s budget. If you’ve been thinking about purchasing your first press or looking to replace (or upgrade) your current coffee maker, read on to find out what you need to know. Espro is known for manufacturing high-quality coffee makers. So when they bill the P7 as the “king of all French presses,” you should probably pay attention. 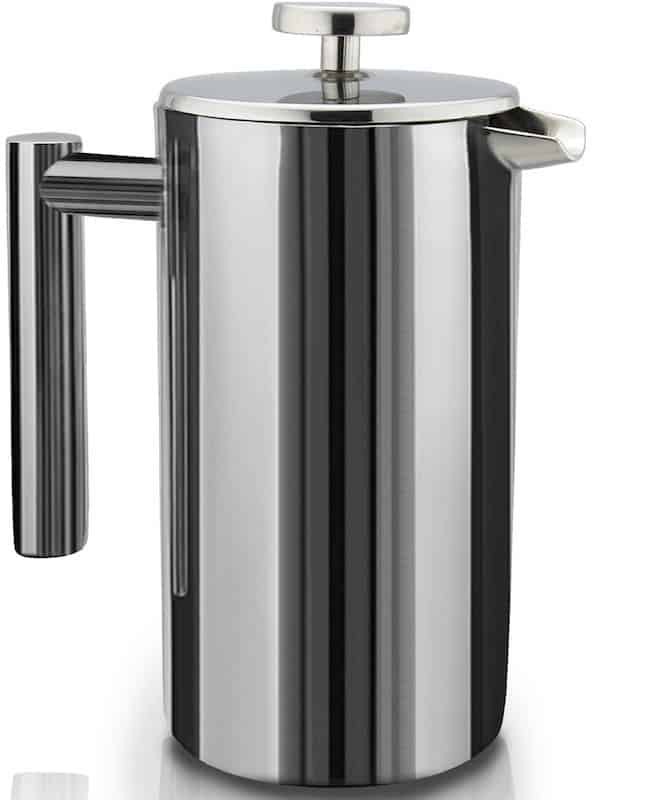 On the outside, the P7 press has a mirror-finish on its polished stainless steel, so it fits in well whether you’re serving a sophisticated tea or just your morning coffee. What really makes this press shine, though, is the technology behind the fancy finish. Unlike a traditional French Press, the Espro P7 uses two patent-pending micro-filters “for the cleanest cup you can get.” These filters are ten times finer than a standard press, and since there are two of them, you get double the filtration. Like Gandalf slamming down his staff on Durin’s Bridge, the double filter combo shouts, “You shall not pass!” to even the most stubborn coffee grounds. Don’t worry, though, they still let all the flavorthrough. And then the P7 keeps your coffee hot for hours thanks to its vacuum insulated walls. Serve your coffee immediately, or prepare it ahead of time. It should still taste great. Since the walls are stainless instead of glass, the P7 is lighter than many presses, so it can be taken on the road if you need. Finally, the Espro P7 does more than just make coffee. Because of its versatile filters, you can experiment with delicate, loose-leaf teas, making vanilla extract, or even creating your own tonic-water. Another model that looks great on the counter, the Frieling Stainless Steel Press will help you make fantastic coffee with limited headache. It is more expensive than many presses, but in this case, you get what you pay for. Unlike many cheaper plunger coffee makers that have poor welds and sub-par construction, the Frieling brings quality and durability to its French Press. If you’re tired of throwing out cheap presses because the carafe breaks or the plunger parts start to fall apart, the Frieling could be the answer. Thanks to its double wall stainless carafe, this press holds heat well. So it can serve coffee in addition to making it. The parts also hold up well in the dishwasher, and the unit is easy to clean. A tight seal and quality screens help keep solids out of your coffee while preserving the flavorful oils that give you a great tasting cup every time. The long handle makes pouring comfortable from multiple angles. 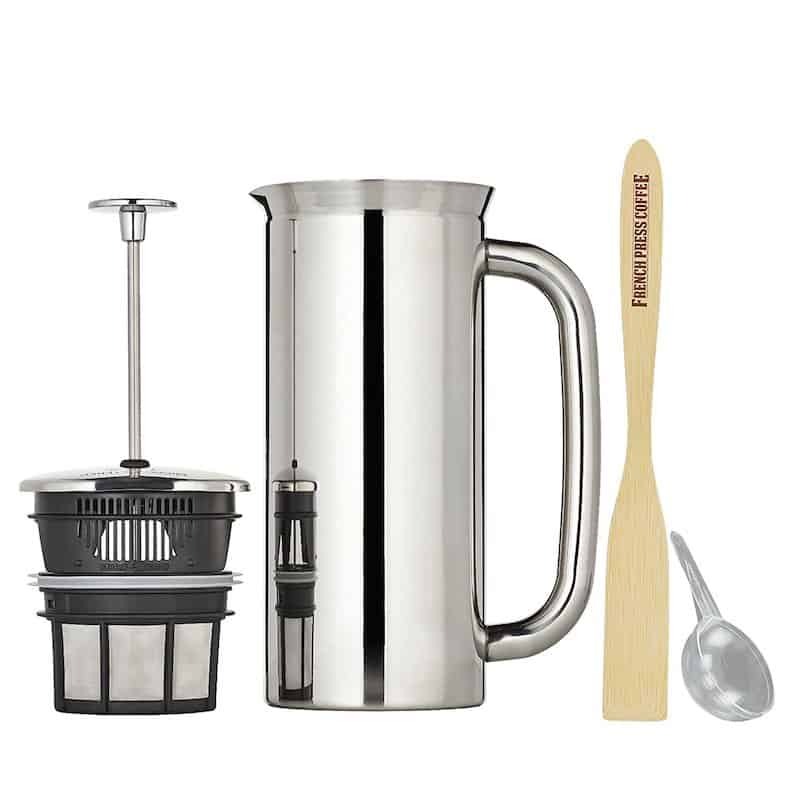 With this Frieling French Press, the process is enjoyable, from brewing to clean up. Well, the clean up is never really enjoyable, but at least it’s not as big of a hassle because ofFrieling’s design. Coffee Gator brings innovation and quality to coffee gadgets. 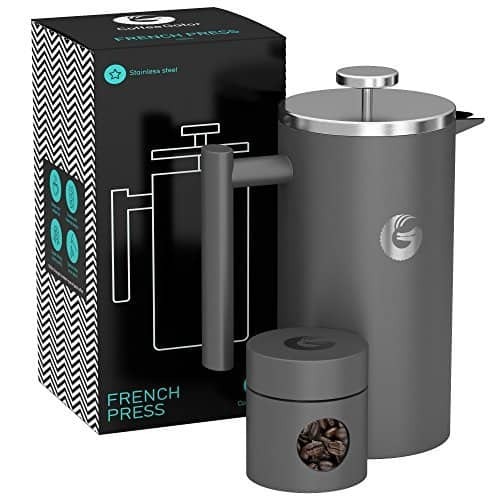 When they designed this French Press, they wanted to provide flavorful, bold coffee that stays hot. In order to do that, they started with a double-layer filter system that delivers a cleaner cup. And the carafe itself is made from vacuum-sealed, double wall stainless steel, which helps keep the contents hot and fresh. For best results, you might want to preheat the carafe with hot water before brewing. If you don’t, the metal could absorb much of the coffees heat, leaving you with lukewarm coffee. The Coffee Gator press comes in a stainless finish, but you can also choose the gunmetal gray if you don’t want to worry about fingerprints. Or, if you’re looking for something bolder, try the orange finish, which will make a statement as it sits on your counter or coffee table. With its “built like a brick” durability, the Coffee Gator should last even if you don’t treat it kindly. Unlike some of the shinier, more expensive metal presses, it will feel at home on your next camping trip. It’s a bit lighter than the Frieling or Espro P7, so it won’t weigh you down as much on the road. With Coffee Gator’s excellent customer service, you can rest assured that you’ll be happy with your purchase. If you prefer the more traditional look of a glass French Press but don’t want to sacrifice quality or durability, you might check out the Espro P3. This glass press has many of the same features you’ll find in its more expensive brothers. When it comes to durability, metal will always win over glass. But not all glass carafes are created equal. For example, the Schott-Duran glass of the P3 is 40% thicker than most glass carafes. This means less chance that it will break and better preservation of heat. The model also has a handy safety lock that prevents the carafe from falling out of the plastic cage. Inside the press, you’ll find the same unique micro-filter design of the P7 and P5. The filter parts are all BPA and BPS free, so you will get nothing but coffee in your drink. If you want to make extra sure that you end up with no sediment in your coffee, you can even use paper filters in the baskets. And if you’re brewing tea, the press has a special filter basket for trapping leaves. So no matter what you are brewing, the Espro P3 should deliver great results for a price that doesn’t bust the budget. For a less expensive metal French Press, the SterlingPro delivers quality and durability. Like the other metal presses in the rundown, this model features double wall construction to help prevent heat loss. Since all the parts are high quality steel, you don’t have to worry about them rusting or breaking. And you can put them through the dishwasher, which makes clean up easier. With its no-frills design, the SterlingPro focuses on making great coffee. While it doesn’t have the micro filter system of the Espro, it does promise no grounds in your coffee thanks to its double-screen filters. If you’re making coffee for one, the 1L model should work fine. But if you need more java in the morning, you can also choose between the 1.5L and 2L models. In all cases, you’ll get a quality press at an affordable price. 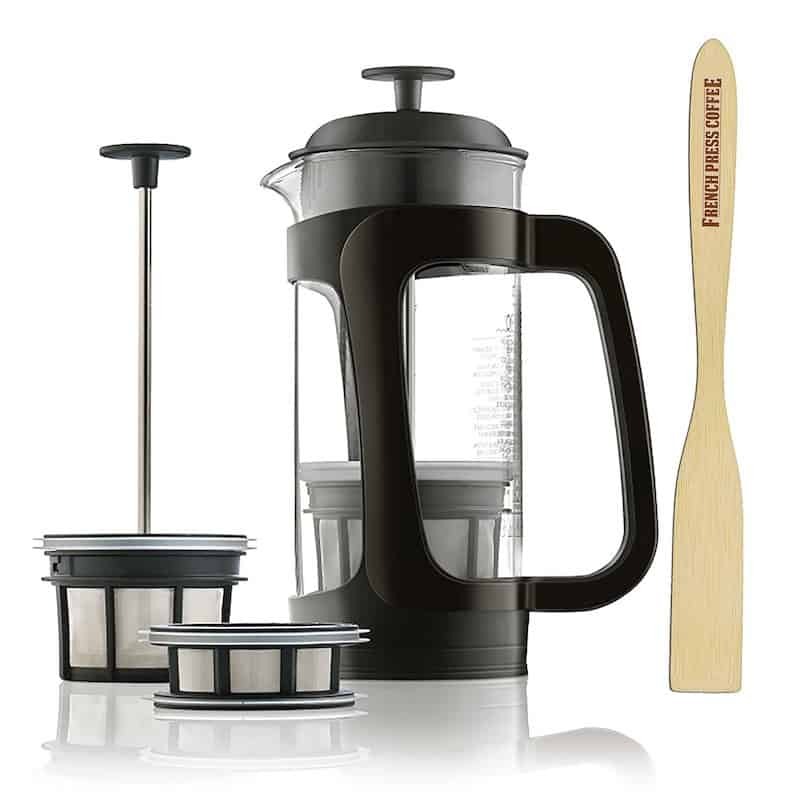 With its sophisticated look and simple design, the GROSCHE Madrid French Press is perfect for many kitchens. It features a sleek look with a chrome housing that holds a carafe made from Schott-Duran glass. Thanks to the heat resilient glass, you don’t have to worry about the coffee maker breaking even as you pour piping hot coffee. Surrounding the durable glass is a minimal housing made from 18/8 Stainless steel that allows you to get a full view of the brewing process. It also holds tightly to the carafe, so no worries about it falling out. When it comes to brewing, the GROSCHE Madrid has a dual filter with spring to keep grounds from creeping up the side of the glass. The lid is also designed to keep the heat in while brewing. The company also has a conscience as a Certified B Corporation. Theirmission is to “bring safe water to those in need,” which it does through their Safe Water Project. So your purchase of a GROSCHE product helps support communities in need of drinking water. While it is a relatively new company on the coffee scene, GROSCHE backs its products with a satisfaction guarantee. So if you’re looking for a modern press for coffee or tea, you probably won’t lose by giving GROSCHE a try. For the coffee drinker who wants quality and a small sticker price, the SterlingPro offers a Glass French Press that leaves cheap competitors behind. With its dual-filter design (the same you’ll find in the Stainless model), this one liter glass press keeps excess grinds in the carafe and out of your cup. You can even experiment with a finer grind and shorter steeping time. Thanks to its heat resistant glass, the SterlingPro is also more likely to stand up to repeated use. Unlike many cheaper models, the glass carafe doesn’t weaken from brewing or dishwasher cycles. So, assuming you’re careful, this press should last a while and look great on the counter. Some users might not like the use of a plastic liner in the lid because they won’t want plastic anywhere near their coffee. If you can move past that, though, you’ll appreciate that the liner helps keep in the heat during the steep. Plus, it helps protect you from getting burned from a toasty lid. The SterlingPro Glass press offers a traditional look with a mirrored finish on the lid and just enough of a frame to keep the carafe in place while pouring without blocking you from seeing your beautiful brew. 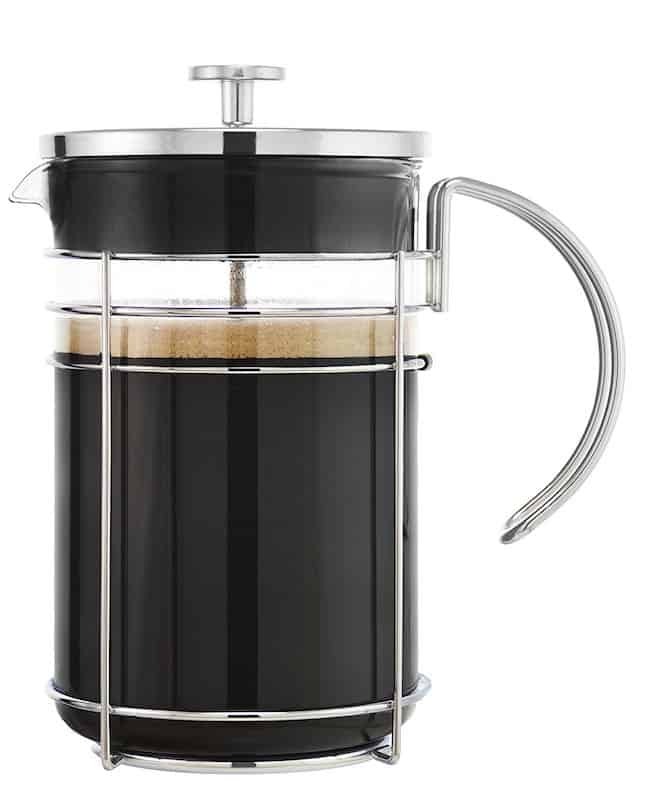 When you think of French Press, you very likely picture a Bodum model. While they might have trouble defending the “original” claim, they are definitely synonymous with this brewing method. It’s design truly is iconic and often copied. The stainless steel frame and lid provide a great look, and the chrome finish should protect your press for years. The heat-resistant handle will also protect your hands and fingers when pouring. The filter itself is Stainless steel and disassembles into just three parts: the spiral plate, mesh, and bottom cross plate. While there is only one filter, it is a fine mesh and does a good job of keeping your coffee clean. (Not as clean as some of the newer micro-filters or dual-screens.) This simple design does make it easy to clean and maintain though. 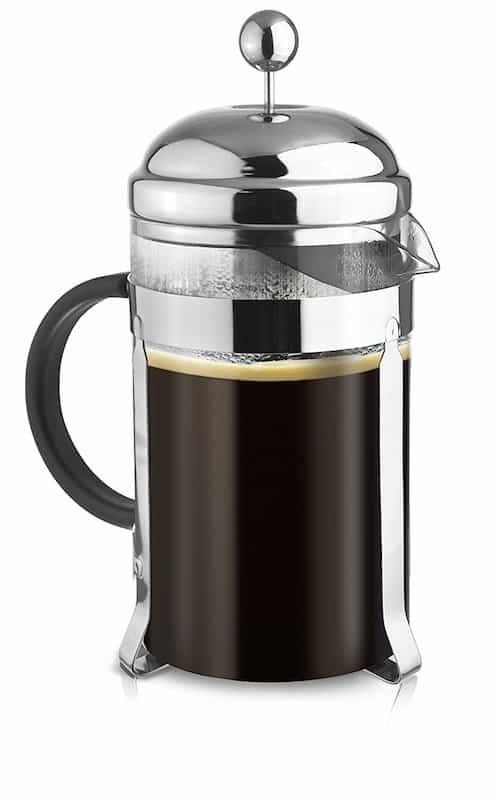 If you want to stick with a well-known quantity, you can’t really go wrong with a Bodum press. Sometimes you need your coffee to move with you. Maybe you’re a commuter, or a camper who wants a great cup of coffee even in the woods. If that’s the case, you should check out the Espro Travel Press. 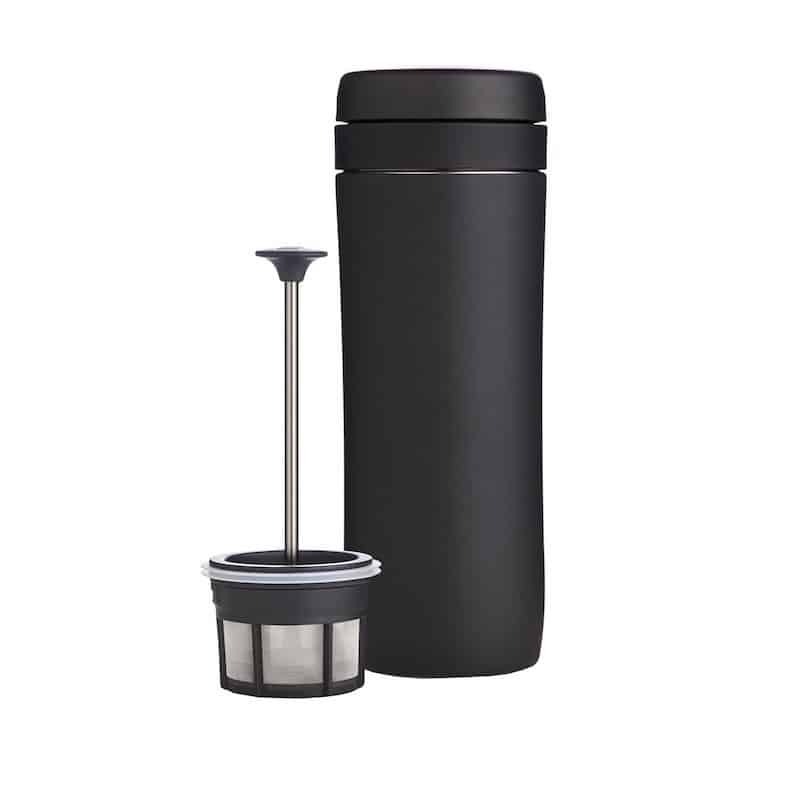 With a little innovation (okay, a lot of innovation), Espro put all the components of a quality press into a travel mug. From the outside, you might mistake the press for a tall travel mug. X-ray vision would show you that this clever mug actually contains a small filter basket and plunger, which is basically all you need to make a great French Press brew. Just add coffee, hot water, and screw on the lid (with the filter attached). After 3 to 4 minutes, you can press and serve. With the same micro-filtration that the larger Espro presses provide, you’ll get grind-free coffee. And since it’s in a thermally-insulated travel mug, that flavorful coffee will stay hot for hours (up to 4-6 hours). Granted, it only holds 12 oz, so it’s not the solution for making coffee for the whole family (or the entire camping troupe), but it will serve a solo drinker well. 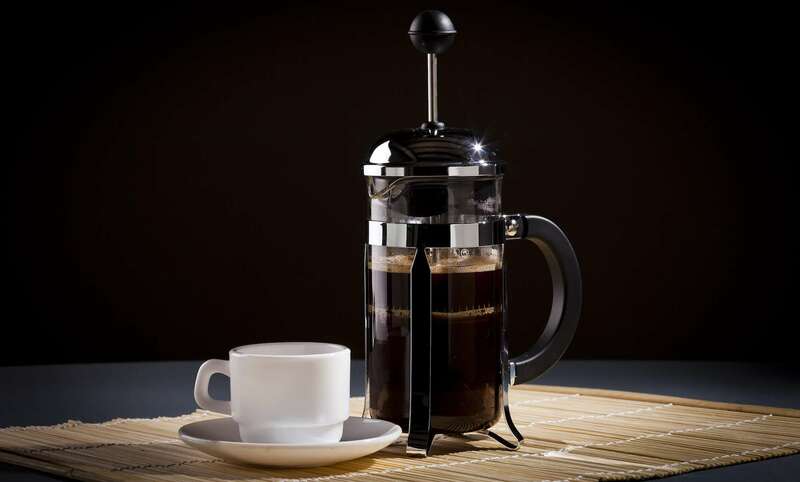 Another top contender in the travel French Press category is the JavaPress from GSI Outdoors. This compact coffee maker is designed with outdoors activities in mind, benefiting the camper with a lightweight, convenient press wrapped in a neoprene sleeve. Part of the problem with making great plunger coffee on the road is that presses tend to be on the heavy side. GSI addresses this problem with a BPA Free, copolyester carafe. With the plunger and sleeve, this keeps the press’s weight under 12 oz. It’s also shatter resistant, so you don’t have to worry about tossing it in with your other camping gear. Unfortunately, the design doesn’t produce as clean or bold a flavor as the other presses in the rundown. And while the filter design does keep most grains out of your coffee, it can be a bit muddy in the end. 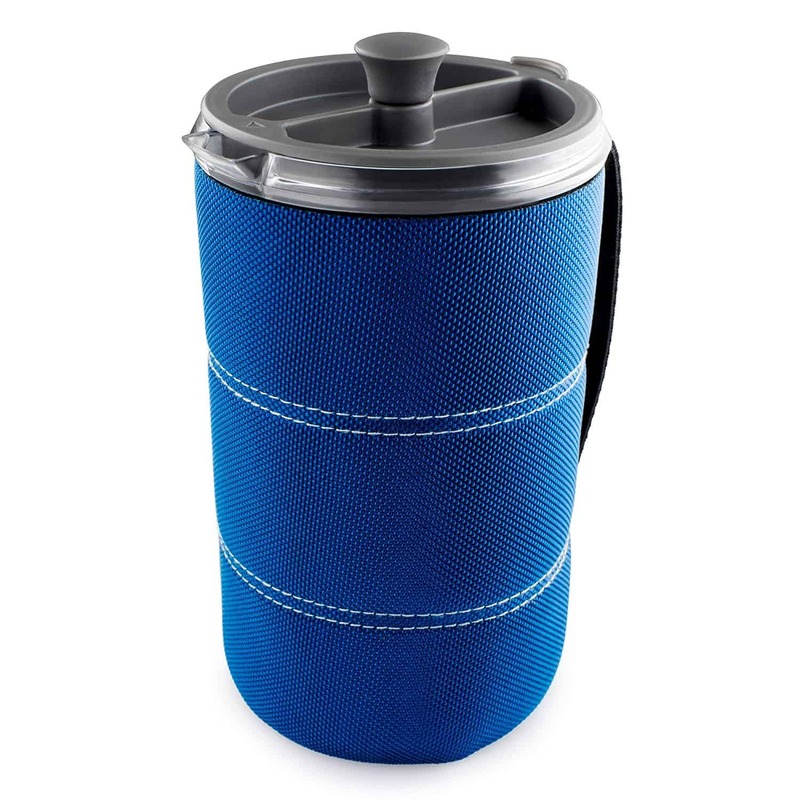 The neoprene sleeve, which includes a handy collapsible handle, helps keep your brew warm while brewing and even after. But you won’t want to leave it in for too long. Compared to the AeroPress, or other travel coffee makers, the JavaPress is a bit bulky. Still, it makes a decent French Press brew, which some of us just can’t go without. For GSI, “It’s all about the outdoors.” If you feel the same, their 30 oz JavaPress may be the solution for your camping coffee. Why Buy a French Press? Rather, they can make great coffee. In the hands of an experienced brewer, a French Press can deliver some of the most delightful coffee you’ll ever have. And fortunately, it’s not a method that requires extensive training or practice. Why do so many people prefer this traditional brewing method? While paper filters help keep your coffee from becoming a gritty mess, they also keep out some of the oils and flavors that give coffee its unique aroma and taste. This is especially true with unique roasts that have been given extra care and attention. The mesh of a quality French Press helps preserve flavor without sacrificing the texture of the coffee. Much like with tea, the French Press method requires coffee grinds to steep in hot water. This allows for full extraction of the coffee. And for many, it creates the best flavor experience. In other processes (some drip machines in particular), not all of the grounds will come in contact with the water. That means you’re wasting some coffee and not getting the full flavor profile you should.Because the coffee is totally immersed in water during a French Press brew, all of it is saturated with hot water. So nothing goes to waste. French Presses remain popular in part because of their simplicity. They boil (though not literally) the process down to its simplest components: hot water and ground coffee. First, you’ll want a consistent, coarse grind. While some presses are more forgiving with finer grinds, you don’t want a mix of large and small particles. That will lead to over or under extraction. If you don’t have a decent burr grinder, consider having your coffee shop grind your beans for you. Just be sure to tell them it’s for a French Press. Add your coffee to the carafe, then pour in your hot water. You’ll want water that is right around 200 degrees Fahrenheit. If you don’t have a kettle that allows for precision, just boil your water and wait for around 30 seconds. No need to worry about fancy swirl patterns like with a pour over. Most experts suggest giving the grounds a quick stir after filling the carafe to make sure that no coffee stays on top of the water, out of the extraction zone. Then cover with the lid/plunger and steep for around three to five minutes depending on your grind and preferences. You’ll want to experiment a bit with your steeping to get just the right amount of extraction. After your time is up, press down on the plunger slowly and pour a great cup of coffee. 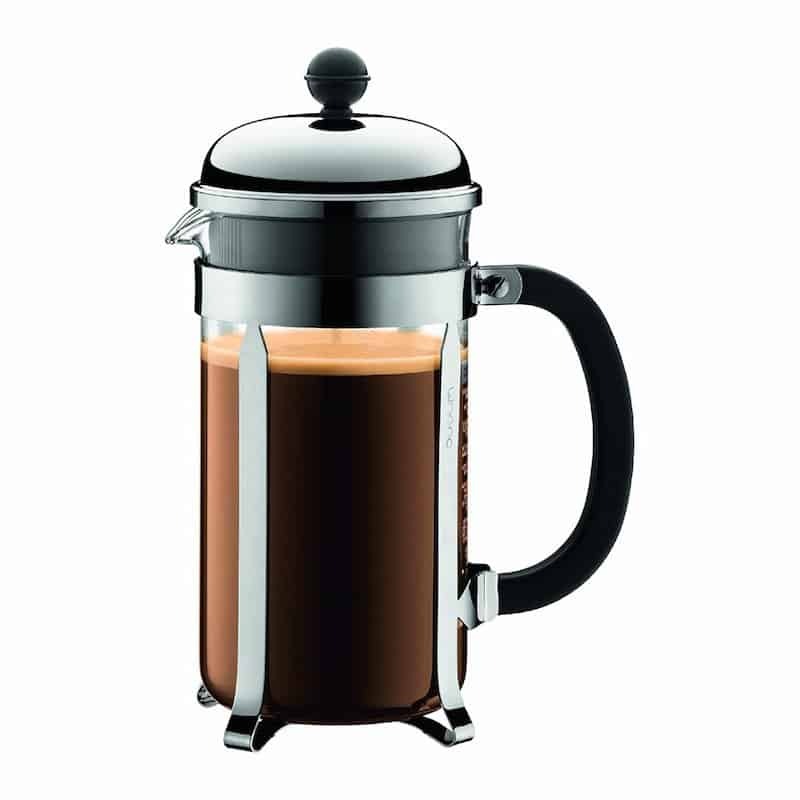 Again, part of the beauty of the French Press is in its simplicity. But even with just a few parts, you can find a wide variety of models. Here are a few features and specs to make note of when shopping around. In addition to portability, you’ll want to think about how much coffee you (or your crew) consume. Many models come in different sizes, generally from a personal three cup to a standard eight cup (and bigger). Don’t just get the biggest you can find, though. The larger carafes and filters aren’t as good at plunging small batches. Even if you don’t plan on taking your press on the road, you’ll want a press that lasts. And for many users, that means avoiding glass carafes. They can break during cleaning or make a frustrating hazard in the dishwasher. Some overzealous plungers have even broken carafes because their grind was too fine and clogged the filter. 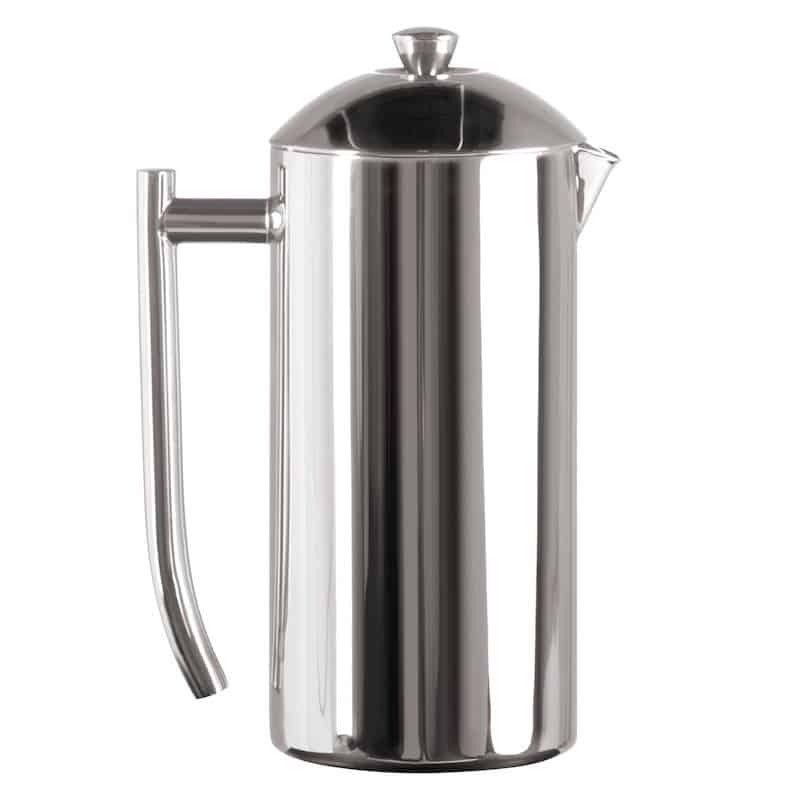 Stainless steel is the typical choice for a more durable and efficient carafe. They also tend to hold heat better and don’t require separate frames. Purists, however, will suggest that only glass will deliver a truly untainted coffee experience. The French Press puts all the elements of great coffee together. But you then need to separate the liquids from the solids. The standard mesh filter and spring design works for most brewers. If you really can’t stand the occasional loose grind or muddy coffee, though, some modern presses offer micro-filtration or double screens to do their best to clean your coffee. Keep in mind that in addition to the screens, you’ll need a tight seal around the edge to ensure that no stragglers sneak up the side of the carafe. A French Press is a classic coffee maker, and many manufacturers stick with a traditional design. Others add design flair that may or may not work in your kitchen. So think about whether you want to look at a particular model day in and day out. While most can be stowed away easily, you’ll likely want to keep it handy once you’ve mastered the technique. As always, the cost of a coffee gadget is worth keeping in mind. Luckily, most models, even the most popular and highest-rated presses fall somewhere between $25 and $150. It really is a category that has something for everyone. As you can see, you have loads of choices for your next French Press. Whether you want a press that’s fine enough for a centerpiece or a model you can toss in the backseat or camper, modern press makers can meet your needs. Have I left any must-buy presses off the list? What’s your favorite style or model?